I always used to think that staying on top of my financial record-keeping was an impossible task. Dealing with my receipts for tax purposes was my biggest hurdle, I decided I had to find a way to get organized and stay organized. Once I discovered how much easier things are with a receipt scanner, I’ve not looked back. Now, I’m always ready for tax time. I spent a lot of time researching and trying receipt scanners to find the best one for me. This guide is here so you can find the right one for you as well. If you don’t organize your receipts, you’ll risk missing out on deductions and end up paying more in taxes. Or worse yet, you’ll be in serious trouble if you get audited and can’t back up your numbers with good records. You’ll be able to rest easy and feel good about being organized when you scan your receipts using one of these scanners. 11.1 What is the best receipt organizer software? 11.2 Is there a better receipt scanner app on IOS or Android? 11.3 Which receipt scanners are compatible with QuickBooks? 11.4 Which is best for Mac? 11.5 What is OCR (text recognition)? You don’t reach the #1 Best Seller in a category on Amazon without good cause. Japanese company Fujitsu has been leading the way for years in making a number of high-quality IT equipment. What makes this scanner stand out is how much it can simplify your life. Scanning receipts can be a chore but this scanner makes it easy. It offers double-sided scanning and an automatic feeder system. That means you can just take a big stack of receipts and let the machine do everything for you. The ScanSnap Receipt program not only scans the receipts but it also uses OCR to extract all of the data on the receipts into a CSV file. This can really help with preparing to file your taxes and just keeping track of your expenses, whether personal or business. It even works with a number of international currencies beyond just the US dollar. You can use either a PC or a Mac with this scanner and it also seamlessly integrates with cloud services like Dropbox, Google Drive, OneDrive, Evernote, Google Docs, and Salesforce. You can even scan to the ScanSnap Connect App (IOS – Android) and access your scanned receipts and documents on your phone or tablet. Automatically syncing between your computer and mobile device is also possible. If you want your scanner to be able to do more than just scan receipts, the Fujitsu ScanSnap IX500 has you covered. It can handle documents, photos, business cards, and more. You’re even able to scan documents larger than a typical sheet of office paper. As of this writing, the over 700 Amazon reviewers have given it a 4.7-star average, with the majority of those reviews being perfect 5-stars. Buyers describe it as a well-designed workhorse that quickly and easily gets the job done. The accuracy of the OCR is another point of praise, a factor that can be really important when scanning receipts to organize and track your finances. 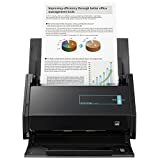 Verdict: This scanner is an excellent option if you’re looking for a versatile scanner that scans receipts quickly and accurately, is easy to use, and can automatically export your data into a spreadsheet. This is another scanner that lets you sync your scanned documents between devices. It also securely backs up everything that you scan on the NeatDesk servers. This backup service is free for one year but then reverts to a subscription-based model after that. This kind of backup service can provide some peace of mind in case something were to happen to your computer or phone. You wouldn’t have to worry that all of your scans were lost. You can scan documents and business cards as well as receipts with this scanner. There are special trays for scanning different types of material. You can add up to 15 receipts at a time to the input tray. Whatever you scan can be automatically exported to PDF, Excel, Quicken, QuickBooks, or TurboTax with just the touch of a button. The scanner does feature OCR so all of the receipt data that you export will be easily searchable and editable. This scanner is available for both PC and Mac, but it’s important to note that the NeatDesk application has not been updated and you may run into some major challenges when using it with newer operating systems. Although the scanner itself works well, the issues with the computer application are concerning. This is the problem pointed to in the many 1-star reviews the scanner has received on Amazon. Verdict: At one point, this was one of the best receipt scanners available. It still has potential to be great, but the application you need to use it hasn’t been updated and this means the potential for some very frustrating problems. Epson always makes “best of” lists for scanners. They are particularly well-known for making great photo scanners. This scanner is designed for business use, as the name Workforce suggests. You can scan documents, business cards, and receipts with ease. This scanner is compatible with both PC and Mac computers. It also allows you to easily connect to Dropbox, SharePoint, Google Drive, Evernote, and more. Unfortunately, you can’t scan directly to these locations. Instead, you must first scan the document or receipt and then click to send the scanned document on to one of these services. It’s not a huge time cost but it is one extra little step that it would nice to eliminate. You can also wirelessly scan right to your smartphone or tablet. OCR software is included with this scanner, so you can turn your receipts into searchable and editable data in a spreadsheet. One downside to this scanner is that its wireless functionality is on the slow side. If you’re looking for maximum efficiency, you’ll be better served by connecting with a cable. If you don’t mind a few extra seconds of wait time, the wireless functionality is good enough. Verdict: I’ve always said that you can’t go wrong with an Epson scanner. For scanning receipts, it’s not the very best option out there but the Epson Workforce ES500W offers good value and will get the job done. If you want a great scanning solution for your receipts but you don’t want another big piece of equipment taking up a bunch of room on your desk. the Doxis GO is worth looking at. This scanner is really small and it’s easily portable. It’s about the same size as a rolled up magazine. You can put it away in a drawer when not in use or tuck it in your bag and take it with you when you travel. It’s also fully wireless and features a rechargeable battery that can scan 400 receipts on a single charge. You might think that the small size means it can’t do all that much but you’d be surprised. This can scan just as well as other larger, more complicated scanners. You don’t even need a computer to use the Doxie GO. Your scans are sent to the Doxie app and can also be sent to services like Dropbox, OneNote, Evernote, and iCloud Drive or applications on your computer. Up to 4000 pages can also be stored right in the scanner’s SD card memory so if you scan some receipts when you are out and about, you can wait until you have WiFi available before syncing the scans with your devices. OCR is included as well, so all the data from your receipts will be searchable and easy to add to your financial spreadsheets. Verdict: If you want a receipt scanner that is small and portable but that also works really well, the Doxie GO is ideal. This isn’t nearly as small or portable as the Doxie GO, but it is much smaller than the Fujitsu ScanSnap IX500. Weighing it at just over 3 pounds, it is easily portable and you can plug it into your PC or Mac’s USB ports if you don’t have an outlet available. You have a number of options for scanning, including PDF, Word, Excel, and JPEG. You can connect this to your computer in either a wired or wireless manner. This scanner works with both PC and Mac. You can also scan to the cloud using services like Dropbox and Evernote. Or you can use the ScanSnap app on your smartphone, tablet, or Kindle. Verdict: If the Fujitsu ScanSnap IX500 is out of your price range, the Fujitsu ScanSnap S1300I is a good option that gives you access to that great ScanSnap Receipts software while also offering the advantage of portability. This is another receipt scanner design that is made for maximum portability. It is small in size and extremely lightweight. This makes it easy to put away out of sight when not in use and it’s also really convenient to tuck it in a bag to take with you when you travel. This scanner is powered via USB so you’ll need some kind of USB port to plug it into, whether that be a computer or a wall charger. Especially considering the low price, you get really high quality scans out of this. It does include OCR and ITR (Intelligent Text Recognition) functionality, a very helpful feature for organizing your finances and importing to programs like QuickBooks. This scanner is great for just scanning all of your receipts but there is a lot of value in the receipt organizing software available as well. This is a subscription service with a monthly or annual fee, although you can try it free for a few months at first. The subscription fees are surprisingly affordable. You get access to a number of helpful features that can simplify your financial organization processes, like the ability to create expense reports, upload directly to QuickBooks and tax accounting software, and the ability to share receipt data with others. This scanner is compatible with both PC and Mac computers, though some users report that it does not work well with the latest versions of iOS. Verdict: The NeatReceipts premium portable mobile scanner is a great budget receipt scanner option that also offers superior portability. Although it is subscription-based, the receipt organizing software also offers a lot of value. Something that makes this scanner stand out is the magic wand. It might sound kind of gimmicky but it can be kind of fun to use. You really have a few options for how to use this scanner. You can keep it docked and use the auto-feed feature, just like you do with most other scanners of this type. Or you can undock it and just drag the “magic wand” across whatever you want to scan. You’ll ultimately get a higher resolution and overall better quality when it is docked but there are times when using the magic wand might be more convenient. It’s especially nice for portability. You even get a nice little protective carrying case for the magic wand. This scanner has a rechargeable lithium ion battery and it will last around 400 scans on a single charge. Another feature that makes this scanner attractive is the ability to save your scans to a microSD card. It comes with an 8GB microSD card and an adapter. You can fit up to 5,000 files on this card. This scanner really keeps things simple and only lets you save your scans as PDFs or JPEGs. It does feature OCR functionality, though, so your PDFs will be searchable and editable. To view your files and transfer them to your computer, you can connect the scanner with a USB cable or you can just use the microSD card to access your files on another device. Verdict: The magic wand feature on the Vupoint ST470 is just plain fun to use. This scanner is also portable, simple, and offers the ability to store scans on an SD card. Epson’s Perfection line of professional scanners are the best on the market but they are designed for doing a lot more than just scanning receipts. If scanning receipts is your main objective, a much more affordable and simple option like the Epson Workforce DS-30 makes sense. This is another really small and lightweight scanner, making it easily portable. I like that this comes with a storage pouch, something that makes it even easier to carry with you in a bag. It works with both PCs and Macs and connects using a USB cable. You can also scan and upload directly to the cloud. You need to plug it into some kind of USB port in order for it to work as it doesn’t have a battery and must be plugged to power it. All the text you scan will be searchable and editable, as your PDFs use OCR to turn your receipt scan into usable data. This lets you easily add it to an Excel file or upload it to programs like QuickBooks and tax preparation software. Like all scanners of this type, calibration is required for successful scanning and this can sometimes be a bit finicky. It does come with special sheets to use for calibration and cleaning. Dust can cause problems with the scan working well and creating accurate OCR renderings but the the cleaning sheet should prevent any problems. For best results, you may need to play around with the software settings as the settings out-of-the-box don’t have super high resolution. This can interfere with accurate OCR. Verdict: This definitely isn’t as nice as Epson’s professional model scanners, but the Workforce DS-30 is perfectly acceptable for scanning receipts and the price is right. This scanner from Brother is a good scanner but the real value with this one is the suite of software that comes bundled with it. There are programs for managing documents, business cards, and receipts. The receipt management software is particularly good and can help you organize your receipts in a way that will work for you. If you use QuickBooks, you’ll be happy to know that this receipt management software is fully compatible with QuickBooks and Quicken. You can export all of your receipt data to these services seamlessly. This is another relatively small and portable scanner but it is a bit bigger than some other options. It does not have a battery but needs to be powered via USB cable. It works with Windows, Mac, and Linux operating systems. You have a number of options for where to send your scans. You can send them to be saved on your local machine or you can send them by email or FTP to another location. You can also send scans directly to be printed. Verdict: The Brother DS-720D is an affordable scanner that does a decent job of scanning receipts but provides a ton of value with the included receipt management software. These days, we all use our smartphones for about everything. There are a number of apps available for both iOS and Android that let you use your phone as a kind of scanner. With iOS 11, this scanner-like functionality is even built right into the Notes app. None of them work quite as well as a standalone scanner but they may get the job done well enough for your needs. It is definitely a more time-intensive process and it can be a hassle, especially when you want to scan several receipts at once. Another downside with using your smartphone as a scanner is the lack of OCR functionality in most apps. If you want to be able to add your receipt data to a spreadsheet for your financial records or tax preparation, you’ll be much better served with a scanner. What is the best receipt organizer software? There are a lot of different methods for organizing receipts. In the pre-digital days, it was common for people to just use envelopes or even shoe-boxes to store receipts. Today, there is software and apps to help you organize all of your digital clutter. One of the best options plays on this old way or storage. The software Shoeboxed is one of the best ways to keep all of your receipts organized. A lot of these scanners also come with software that can help you organize your receipts. The Fujitsu ScanSnap software is really good. The Neat software is also excellent. 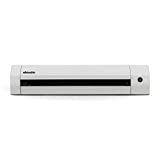 The receipt management that comes bundled with the Brother DS-270D is another good option. Is there a better receipt scanner app on IOS or Android? There are several apps for both iOS and Android but none of them are better than a standalone scanner. You just can’t get the same level of quality. It’s also a much more time-intensive process to scan. Most scanning apps don’t have the best OCR functionality, if they have it at all. Many of these scanners allow you to directly import your receipt data to QuickBooks. Scanners that work really well with integrated QuickBooks access are the Fujitsu ScanSnap IX500 and the NeatReceipts Premium Portable Mobile Scanner. Even with the ones that don’t, though, it’s pretty easy to import OCR-rendered data to QuickBooks. Which is best for Mac? Most of the scanners on this list will work with Mac. In some cases, like with the NeatDesk Desktop Scanner, there are two separate versions of the scanner, one for PC and one for Mac. The best one for Mac on this list is the Fujitsu ScanSnap IX500. In some cases, like with the Vupoint ST470, the scanner itself will work with Mac but the OCR software will not. With PDF files or word documents, you can typically search by word or number to quickly and easily find something you’re looking for. When you scan a document and receipt, you may be able to input that same search functionality with the help of OCR. Without OCR, the information on your receipt is just treated like an image. OCR stands for Optical Character Recognition. It goes through and turns the image of your receipt into letters and numbers. This can be really helpful, especially for organizational purposes and for searching your content later. For receipts, specifically, OCR makes it easy to import all of your receipt data into a spreadsheet for things like tax preparation. A receipt scanner really made my record keeping and tax prep go much more smoothly. I know it really gives me peace of mind knowing that my records are organized so I’ll be prepared if I’m ever audited. When buying a receipt scanner, it’s important to consider whether the scanner is compatible with programs you use, its size and whether or not it is portable, and how easy it is to use. For me, I like a scanner that is versatile and can do more than just scan receipts. Have you ever scanned your receipts? Do you have any tips for keeping your receipts organized? Thanks for the information. I have to find a new scanner since the NEAT company is holding my data hostage. I have an older model that I have used for 5 years. When Neat decided to change their business model my older model stopped working and the data became inaccessible. After calling them they uploaded the data to their cloud then said it will cost over $100.00 to get it back in a CVS file. Then they removed the Neat exe file from my computer. I am thinking of contacting a lawyer. I agree. I don’t know what they were thinking on how they could change the business model and not impact their customers. And to top it off, like your situation – charge you for your own data after THEY changed the rules. This is how companies end up fading away by losing customer confidence and loyalty. Its absurd and maybe there is a legal angle to this. I agree as well! Neat was a great scanner – but doesn’t work with the change unless you pay for cloud with repeated payments! Thanks for the info on Neat. That is what I thought I wanted. I didn’t understand the service. I just want to load my piling up receipts and move on. I honestly do not care for one brand or another. I just need a scanner for my mother, she is in her 70’s (pretty good with computers) and she keeps receipts for EVERYTHING she buys. Can anyone suggest a good scanner for her records keeping. Should be OCR capable so the scans can be imported into an excel file. Great resource!! I have always struggled with organization. Receipt scanners are a must!